Topic: Dagger GTX 8.1 Action Spec. Dagger GTX 8.1 Action Spec. Good used condition, no dents, welds, repairs, or damage to outfitting but normal scratching from WW use. Stout outfitting. £595 or near offer. Collection from near to Stoke-on-Trent (ST11). Nice green / white / blue colour. Selling a Mobius 65 atm, god condition £500 Inc Jackson happy feet. Located in Stoke-on-Trent. Used happy feet for sale, some discoloration but work fine £35 posted. Need the space this boat is taking up. Make me a realistic offer and it's yours. Collect from near Stoke on Trent. For sale again, £450 Ono. Yep, drop me a line if you are interested via private message. Spanish Fly OC1 for sale. Spanish fly for sale, excellent condition no welds etc. Air bags, saddle, dashboard and adjustable foot pegs fitted. Located in Stoke on Trent, Staffordshire. Collection or happy to wrap if you arrange your own courier. £500 ovno. What weight / inseam / foot size was it cut for? Topic: Help with Planning a Trip to the Ure? Re: Help with Planning a Trip to the Ure? Extra photo which shows well the great condition of this boat. 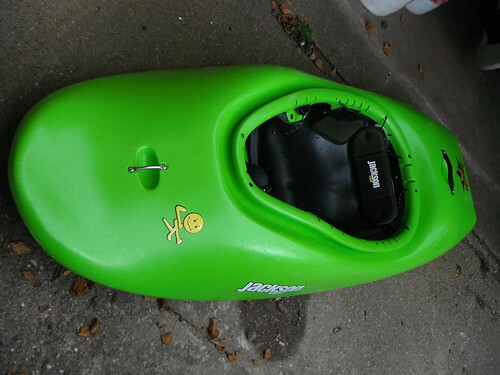 Will throw in a playboater spraydeck (with kevlar lip) in excellent condition to fit this boat. This deck would cost about £100 new. Paddled the Churnett today from the black Lion at Consall to Froghall at c0.4-0.6 on the gauge at Basford bridge. There are several large trees down across the river forming large river wide strainers. Today these just meant brief portages but at higher levels would be more of a concern. Topic: WTS: Mad River Explorer 16 TT. Re: WTS: Mad River Explorer 16 TT. Lol just reread the above and the auto correct on my iPad managed to turn glitter to clotted somehow..... Anyhow the boat is finished as follows: red glitter deck with wide pure white stripe and a pure white hull. The cockpit rim, side seam and tips are black. All in gel coat.